Brenda Watson’s H.O.P.E. 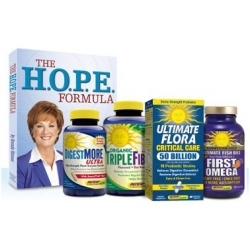 Formula is a 4-part daily nutritional plan that combines the proven benefits of High fiber, Omega oils, Probiotics and Enzymes for optimal digestive function and overall health.‡ This comprehensive kit includes Organic Triple Fiber, Norwegian Gold First Omega, Ultimate Flora Critical Care 50 Billion and DigestMORE Ultra—plus a FREE copy of Brenda’s best-selling H.O.P.E. Formula book! High Fiber: Foods high in fiber add bulk to the diet, which helps to strengthen and tone the colon muscles. Fiber also helps to absorb and eliminate toxins from the digestive tract. Omega Oils: Natural Omega oils provide the necessary lubrication for smooth and gentle elimination and also help nourish the cells in the intestinal tract. Probiotics: Beneficial probiotics promote healthy digestive and immune function by crowding out harmful bacteria in the digestive tract and promoting the growth of healthy flora. Enzymes: Digestive enzymes help break down a variety of foods such as carbohydrates, proteins, fats, sugars and dairy. They also enhance nutrient absorption from food. Discover why a daily regimen of High fiber, Omega Oils, Probiotics and Enzymes is the secret to optimal digestion and vibrant health!